The only mildly interesting scene in that otherwise steaming heap of found-footage nonsense Apollo 18 is when the US astronauts stumble across the Soviet LK Lunar lander sitting in a crater. The real thing was flown unmanned in orbit but never made it to its final destination. Lack of co-ordination and investment in a launch rocket to match the Saturn V led to the Russians falling behind in the race to put a man on the moon, and the rest is history. The engineering model of the LK Lunar lander (i.e. the copy used on earth by mission scientists to play around with while the real thing is in space) is currently in the British Science Museum in London as part of the Cosmonauts: Birth of the Space Age exhibition which is scheduled to run until 13 March 2016. And by God it’s impressive – a huge beast of a spaceship roughly the same size as NASA’s LEM but designed to carry only one very brave Cosmonaut down the the lunar surface and back up again. Part of its impact is the fact that it’s so different from the Eagle and its descendants, and was hidden away for ages by the USSR’s highly secretive space program. If you look closely at it you can see that it’s essentially a Vostok with legs stuck on it. While small the exhibition is, in my opinion, totally worth it – not least because it’s brilliantly put together and very informative, beginning with Tsiolkovsky’s notebook designs for spaceships from the beginning of the 20th century through to the current Soyuz craft ferrying astronauts and supplies up to the ISS. 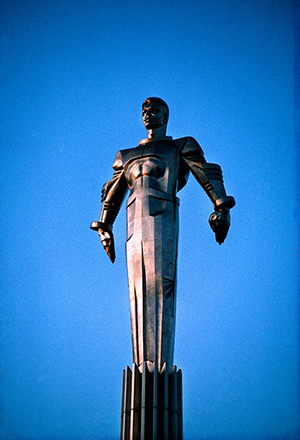 Dreams of space went hand in hand with revolutionary communism in the early Soviet Union, hardly surprising given the atmosphere of utopian futurism in which artists, intellectuals and scientists of the age worked, until Stalin brought it all crashing down into an exercise in squalid tyranny. Enough material existed by 1928 for a nine-volume encyclopedia of space travel to be published in Leningrad, which is pretty remarkable given that no-one had actually launched anything yet. 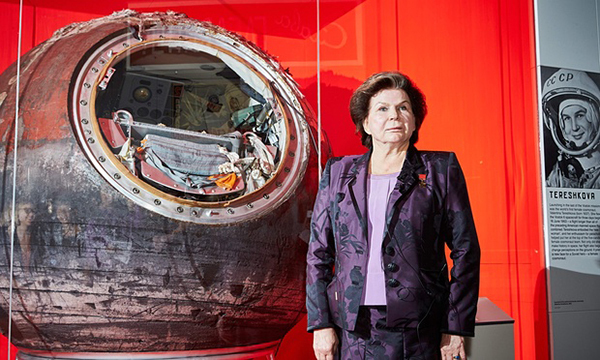 Valentine Tereshkova, first woman in space, stands next to her capsule at opening of the exhibition. So as well displaying some wonderful kit the exhibition also showcases books, posters and souvenirs from the Soviet space era. Many of the examples I showed in this earlier post about Soviet Space Art are here. What I didn’t know at the time was that the images of the rockets on the posters weren’t chosen because they conformed to the accepted shiny-torpedo-with-jets spaceship images of the 1950s, but were designed to mislead western scientists and military experts over the actual designs the Russians had created. 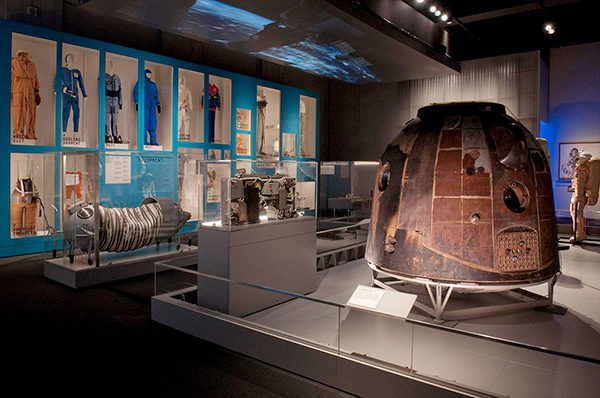 Soyuz TM 14 Descent Module and lots of groovy space wear. 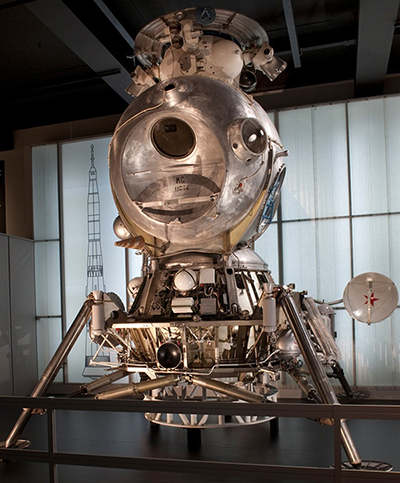 The core of the exhibition is, of course, the space hardware – nearly all of them engineering copies used during the actual missions, from Sputnik through to the Lunokhod moon rover. The actual Vostok 6 which carried the first woman into space, Valentina Tereshkova, is also on show. What’s striking about the craft is how tiny and spartan the interior is. The Cosmonauts were hurled into orbit in metal spheres the size of a mini. Unlike the US astronaut missions most of the time the craft was controlled from the ground, while the passenger sat and looked out of the tiny window and talked about stuff. Having said that, from the very beginning the Cosmonauts orbited the earth, whereas the first two US astronauts just went up to the edge of space and back down again on a ballistic trajectory – like firework rockets. The Voskhod capsule is even more alarming. It’s barely larger than Tereshkova’s ship but had three pilots jammed next to each other. The only way they could send them up was without spacesuits or ejection mechanisms in case anything went wrong. With Nikita Khrushchev endlessly nipping at their heels the Soviet technicians were turning missions around in months, rather than years. The Soviet Space Program was so secretive that its head – Sergei Korolev – was only ever referred to as the ‘Chief Designer’ and hardly ever appeared in public because the government feared he would be a target for foreign agents. After he died in 1966 the main driving force dissipated and lack of funds and political infighting meant that the USSR never managed to build a rocket equivalent to the Saturn V. It’s a shame, because the exhibition, and any glance at the history, shows the incredible level of engineering Korolev and his team managed to achieve in a ridiculously short space of time. 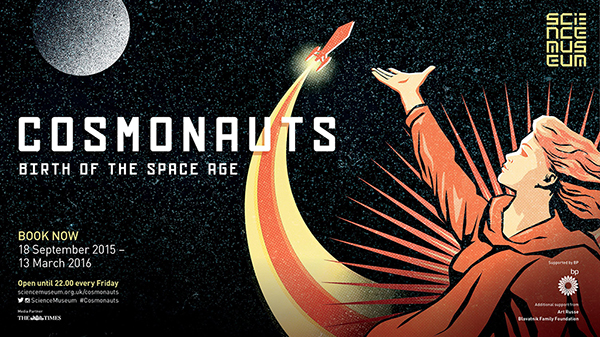 Cosmonauts: Birth of the Space Age is a brilliant exhibition and well worth a look before it ends in March. It costs £14 per person to get in. The Soviets were masters of mechanical and aerospace engineering. Russians still are, though they never truly trusted their own electronics. Sounds like a great exhibit. I’m reading Korolev. It’s a biography of the Chief Designer by James Herford, Executive Director of the American Institute of Aeronautics and Astronautics. Although it’s a bit out of date (it was published in 1997) it’s still an eye-opener on just how advanced the Soviets were in this field.